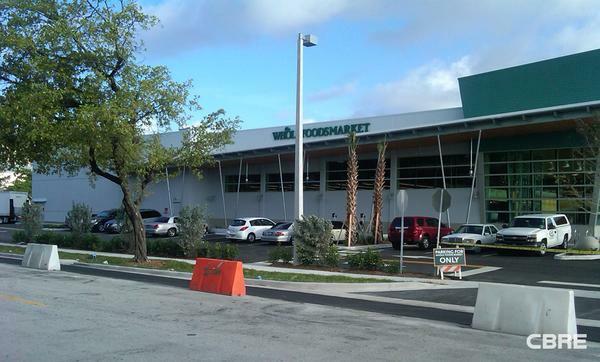 The newly constructed building housing Whole Foods Market in North Miami has sold for $19.8 million. CBRE Senior VP Dennis Carson and senior associate Todd Weintraubrepresented seller Biscayne Partners in the transaction for the 36,000-square-foot building, at 12150 Biscayne Blvd. The seller, which is managed by Aria Mehrabi, was able to pay off a $13 million mortgage from U.S. Bank. The building was completed in May. CBRE identified the seller as Happiness Inc.
“Single-tenant Whole Foods are rarely available to investors, and this one’s very strategic location and the demographics of northeastern Miami-Dade County were especially appealing to investors,” Carson said in a news release. CBRE’s Casey Rosen and David Donnellan also represented the seller in the transaction.